And TODAY is the four-week anniversary of Jason WAKING UP against all odds. 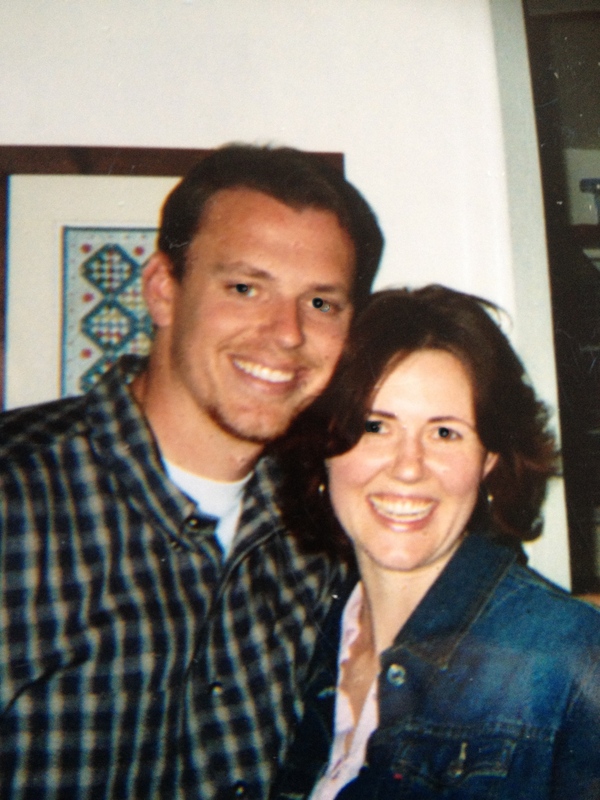 Also, ALSO, it’s our twelve year engaged-a-versary … warranting a fun re-post ….. Ten TWELVE years ago today, I was the Best Girlfriend Ever. Really, it’s true. I said so. Out loud. To my mom. See, I’d just come out of a traumatic relationship. Not a romantic one. A work one. On March 18, 2004, I walked away from my job. Another thing to cross off of my Brave Things I’ve Done list. So come March 19, 2004, I woke up feeling like a new woman, enjoying her first Day Off in a long time. I was excited to do whatever I wanted and answer to absolutely nobody. Then Boyfriend called. Would I drive out to see him in Riverside? To watch basketball – it being the middle of March Madness and all. Could I, would I, be the one to drive to him for a change? Sigh. Yes. Yes I will, because I love you and I’m your Girlfriend and I have a Day Off and blah blah blah. So, being the Best Girlfriend Ever, I readjusted my day, told my To Do List to wait, turned off Daytime TV, and called my mom to tell her how amazing I was. How I was so flexible and selfless and was earning girlfriend gold stars and what-not. How she didn’t snicker at me, I’ll never know. Mom-powers are amazing and mysterious. When I got to Boyfriend’s house, he came out to greet me and suggested a brief walk around campus (where he worked, not went to school – no robbing the cradle here). He then casually suggested we take a drive up to Big Bear, my hometown in the mountains, an hour-ish away. We’ve never before nor never since “just decided to take a drive to Big Bear.” It’s always a planned thing. But I was turning over a new leaf. Flexibility. And also, think of my alternative: watching basketball. Sure, why not? I said, only briefly reminding him that it was the middle of March Madness. More girlfriend-gold-stars after all. If texting had been a thing back then, my mom would have been getting a play-by-play oh my awesome-ness. With each mile we drove up the mountain, I repeatedly thought this is so weird that we’re just taking a random trip to Big Bear. But instead of thinking – even ONCE – about it in a suspicious manner, it only furthered my own sense of girlfriend-greatness. A handful of hours after I graciously swept my day aside in favor of time with my Beau, we pulled into a parking lot near the lake “to take a walk.” Still not suspicious. Seriously? Seriously. Until I saw the candles. Forming a path to the lakeshore. And heard Boyfriend’s breathing change. I caught my own breath as I realized this was IT. He led me down the candle-lit path pre-set by his little engagement elves, back down to the lakeshore where years before he had turned me away, making today the day he’d reclaim that territory and ask me to say yes to forever. Years before, I had prayed just one prayer about the day I might be asked to marry someone. Please God, just let me KNOW the answer, whether it’s yes or no, I want it to be clear. No doubt, no hesitation. I simply couldn’t fathom being stuck somewhere in the middle and answering with an Uhhhh, ummmm, welllll. And there on that fateful day, a resounding Yes! came out of my mouth as naturally as the air I breathe. Sometimes Jason will whisper in my ear, Thanks for saying yes, and I always answer back, Thanks for asking. I’ve never lost sight of just how amazing it is to be asked. Somewhere in the darkness a ring was slipped on my finger – the same one that rests there today. A little known-fact is that Boyfriend and I didn’t kiss, not even when Boyfriend became Fiancée. A fact that shocked even my mother. I’m pretty sure she said something about owing a guy a kiss if he gives you a diamond ring. But it’s just something we decided to save for our wedding day. Not in any holier-than-thou way, but more because we knew our triggers and didn’t need to add another one. So I got a diamond but Boyfriend-turned-Fiancee didn’t get a kiss. Yet. When it all caught up with me, I felt a teeny bit chagrined about the self-applause I’d given myself all day. Way to go, Brooke, you are sooooo selfless. You were willing to clear your schedule and be available for a proposal. Bravo. When we then made our way to my family’s house for a pre-orchestrated celebration party, my mom’s grin said it all. Wow, did I really just brag to you all day about what an awesome girlfriend I am? Yes. And you knew the whole time that he’d be proposing and not watching basketball? Yes. It’s a good thing that I was the Best Girlfriend Ever that day, since it was my last day as a girlfriend.